This Gift collection is based all round ‘him’ and I think currently all the ladies are thinking the same thing – what on earth do I buy? It is definitely a challenge to think of different presents to give for boys, because Obviously every single one is going to be different, so a shirt and tie or fragrance is not going to suit a man who loves spending his time outdoors. So for a little further inspiration for you, I have compiled a range of gifts that will hopefully get those creative ideas ringing in your mind. I know in my family we are always Giving the same gifts (Books, DVD’s or CD’s) years in a row and so it can become quite repetitive and then there is no real surprise (Plus eventually there will be no more to buy that matches with there tastes). So mixing it up with gifts that the person would not think about buying for themselves is always pleasurable, nice and enjoyable experience. A simple and effortless shirt is always a good addition to a man’s wardrobe, even if these are not worn on a daily basis, they are very handy for those going out occasions. We all know that boys like to eat, so with no question a food related gift is always best. It can be anything from a cheese collection to a hamper of nuts, dried fruits or even an assembly of spices and sauces for the times they cook a delightful homely meal. Boys all love toys, so this electronic helicopter is perfect. Don’t get me wrong these are only a handful of some of the exciting gifts that I found when I was browsing the web. 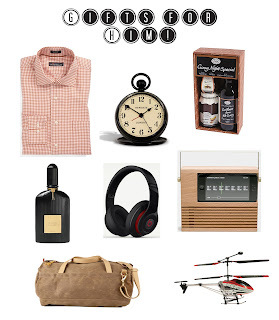 There are hundreds more gifts that would suit the man you are buying for. So I hope you have gained some creativeness from these gifts and have a lovely rest of the week.